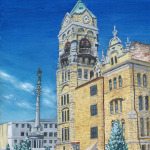 The view from the southeast corner features the County Courthouse with the William J. Nealon Federal Courthouse and Post Office in the background. Between the two is the 144 foot high Soldiers and Sailors Monument with a bronze Goddess of Victory atop it. 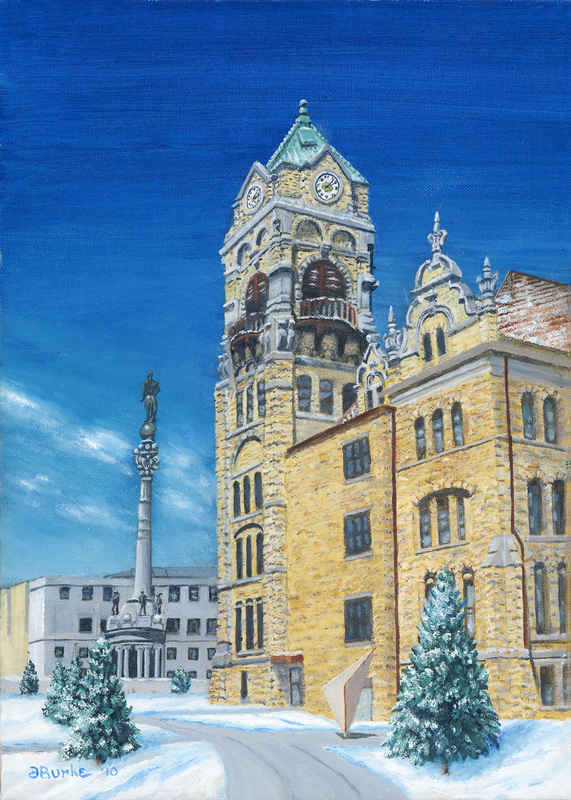 Serving perhaps as a parable for political fortunes in Lackawanna County, the building has experienced many changes over the years. Designed by Isaac G. Perry in the Romanesque Revival style in 1884, the building was originally two stories. In 1896, architect B. Taylor Lacey added the third story, drawing freely on a variety of architectural influences. Other changes ensued. Lightning destroyed the tall original steeple above the clock tower. Its replacement was less than majestic. An unfortunate administrative office addition was thankfully demolished as this century turned. The most recent plaza constructions provide material for our current courthouse sidewalk commentators.